The JOHNSON 65 truly sets the benchmark in styling, performance and advanced engineering. With interiors that are nothing short of impeccable, with a build quality that many others could learn from, this motor yacht will take you and your family where you want to go with ease. A Johnson is the perfect motor yacht for our lifestyle and rugged coastline, with great economical extended cruising capability, being full stabilised and being propelled by Caterpillar engines through commercial spec German made ZF 4000 pod drives or conventional SHAFT DRIVES id required. In an age where families are extending the traditional cruising boundaries and spending longer periods offshore, a Johnson Motor Yacht will leave you wanting for nothing, and having being building class leading vessels from 60 - 125 ft for 20 years, you know you are in safe hands. With 2 x rotating POD drives ( or shaft drives), plus a bow thruster, Naiad stabilisers, underwater exhaust, line handling capstans, a full suite of world class Nav equipment including thermal imaging, air cond, state of the art interior ac/dc control systems, water maker, premium audio visual systems, underwater lighting and more, you certainly wont need to stress yourself when enjoying what this exceptional vessel has to offer. With a full width mater stateroom and expansive ensuite, 2 x more double cabins, both with bathrooms, a huge sky lounge / enclosed bridge, a day bathroom with workshop / storage area for the toys, a expansive saloon with separate dining, a chefs galley with stone surfaces, the laundry zone, a ships office ( that can be specified as a 4th guest cabin if desired), huge external teak laid deck areas, a fwd sun lounge, and a massive swim platform and many more notable features, you would truly be forgiven if you thought this boat was a 75 footer. It really is amazing how well Bill Dixon, the naval architect has used the space. With a massive beam of 5.6 mtrs this vessel is much wider than its competitors, providing stability at rest and at sea and the extra beam also enables the feeling of space that is evident throughout the entire vessel. All Johnson vessels are available with optional additional Hydraulic swim platforms, varying engine options and custom layout plans. We can work with you and Johnson Motor Yachts to create a semi custom vessel that suits your exact needs. Johnson prides themselves in giving the customer what they want. The customer receives the benefit of the quality Far East economies in production, and in the case of Johnson Motor Yachts, 20 years of experience in building world class vessels. 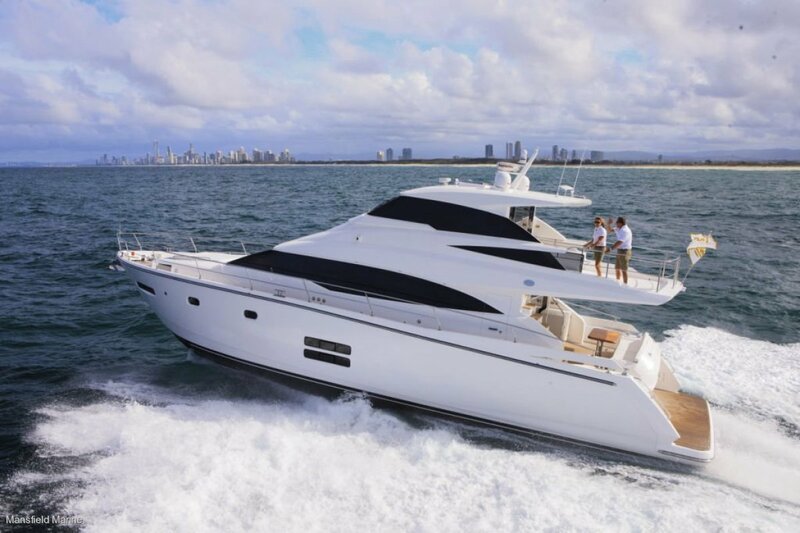 If you were possibly in the market for a Sunseeker, Princess, Fairline, Ferretti, Dominator or Horizon, you should certainly enlighten yourself to the quality of a Johnson Yachts. Contact MANSFIELD MARINE to discuss your potential future in owning a Johnson and enhance your enjoyment in life! We have a selection of pre-owned Johnsons available, so please contact us for more information. A TRULY WORLD CLASS CUSTOM MOTOR YACHT THAT REPRESENTS EXCEPTIONAL VALUE FOR MONEY. Prices are subject to change without notice. The price shown is an indication of the WA delivered price, and is subject to currency fluctuations and specific build specification.